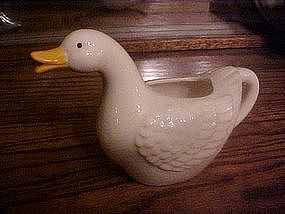 Maybe this is cream pitcher is a goose! It has the foil sticker on the bottom that shows it is a Josef Originals item. Excellent condition and measures 4 1/2" tall and is about 6 3/4" long. Made of nice glazed ceramic.